To see what Thailand holds in store for you, start by getting a free quote. Sailing approximately 28 nm Southeast of Phuket brings you to the Phi Phi Islands – one of southern Thailand’s favorite tourist destinations. Stunning anchorages suitable for overnight stays, and the charming villages offer unique lunchtime stops. Many of the islands in this region are ringed with dazzling coral reefs so rich in marine life that you’ll be tempted to spend all of your time in the water. The Similan Islands are located about 54 nm northwest of Phuket. Just as towering limestone monoliths are a distinguishing geographical feature of southern Thailand, these nine granite islands are distinctive because they are covered by dense tropical jungle. 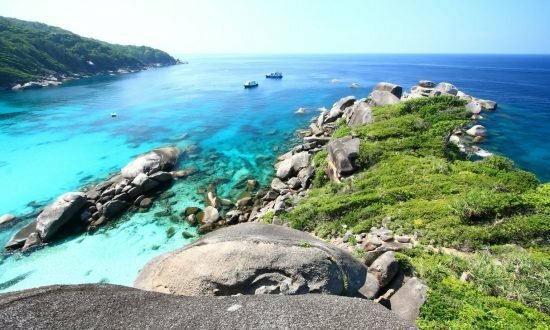 Mu Koh Similan National Park protects the region’s natural resources, and offers some of the finest diving locations in the world. The same volcanic eruptions that created such dramatic island landscapes eons ago also created equally dramatic underwater seascapes. No visa requirement for stay under 30 days. For longer stays, visitors can apply for a 2 x 2 month Visa in any Thai embassy in the world. Currency: Thai Baht: Actual change rate 1 euro=41 Thai baht, 1USD=30Thai Baht. Credit Cards: Accepted only in big resort, not on the small island. ATMs: In all the towns but not in the islands. Traveler Checks: Accepted only in big resorts. Banking Hours: Monday to Friday 9am till 4pm. Some cases of Dengue Fever have been reported, but far inland. From June till October: South west monsoon: humid and rainy: south west wind 5 to 30knt. Day 1: Arrive at Dream Yacht Charter’s Thailand base – Yacht Haven in Northeast Phuket. Board for the night. Day 2: Depart from Phuket and sail to the majestic Phang Nga Bay, where you’ll spend the evening. Day 3: Set sail to one of the most famous groups of islands, Koh Hong, where you’ll discover several secluded beaches – take your pick and make it your own. Day 4: Set sail towards Koh Poda, then onto Koh Kai, where you can to walk from one island to another at low tide. 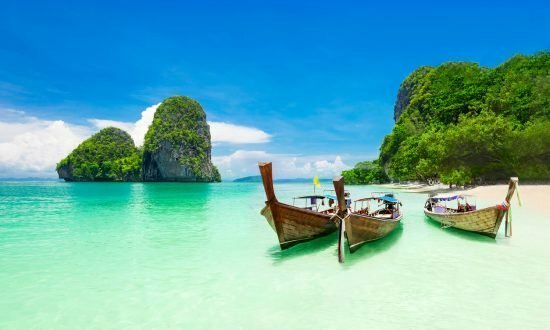 Day 5: After a marvelous day in Koh Kai, head towards Koh Phi Phi, which is considered one of the three most beautiful islands in the world. With its stunning views and famous beaches, Koh Phi Phi will give you an unforgettable stay. Day 6: Sail back to our base in Phuket. Enjoy the beauty of the many Southern islands you pass on your way back. Day 7: Check out at the Dream Yacht Thailand base. Day 1: On your way from the airport, you’ll get your first view of the lush Thai vegetation, Buddhist temples, and picturesque villages. Day 2: After breakfast, set sail to Koh Hong. This exceptional site is only accessible by tender through a cave leading you to an inside open lake surrounded by a 100 m cliff. Lunch on anchorage. Day 3: Depart to Koh Khai Nai, better known as “James Bond Island,” where “The Man With the Golden Gun,” was filmed. Stop at Koh Panyi, a floating village where hundreds of fishermen live. Buy local souvenirs and seafood, then prepare a locally-caught fish dinner on board. Day 4: After breakfast, leave for Koh Hong East and visit the lagoon. Eat a quick lunch then sail to Koh Dam Kai, stopping at Ao Nang. Prepare dinner on board and drop anchor for the evening. Day 5: Eat breakfast on the boat and sail toward Koh Phi Phi with a stop for lunch at Koh Mai Pai, a beautiful sandy beach with coral, fish, and good visibility: a dream for amateur divers. After lunch, depart to Koh Phi Phi Don, one of the most beloved beaches in the world. Next, check out Yongsakem Bay (Monkey Bay). Make your way to Nui Bay for sunset views, dinner, and overnight anchorage. Day 6: After an early breakfast, sail to Koh Phi Phi Ley. Sailing around the island, you’ll discover the cliffs and caves where swallow’s nests are harvested before being exported at very high prices to China. At the end of morning, go back to Koh Phi Phi Don. Mooring at Ton Sai Bay and lunch on board. You will then be able to go shopping and discover the island. Day 7: Breakfast and depart to Koh Kai Nai, a small island with a glowing white sand beach. In the middle of the afternoon, depart to Koh Lawa. Enjoy swimming and hiking on the island, then take in the sunset as you eat dinner. Day 8: Disembark at Yacht Haven Marina after having breakfast on the way. Day 2: Departing from our base in Phuket, sail south towards the Naï Harn, where you’ll spend your first superb night at anchor. 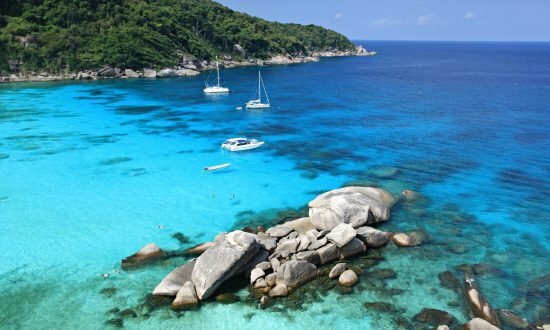 Day 3: Sail towards the magnificent and beautiful Similan Islands, which will captivate you immediately. Huge boulders line the shores on several of the islands, and the pristine white sand beaches are often deserted. The most interesting sights, however, are to be found beneath the waves – some of the most spectacular coral in the world can be seen here. Day 4 – 7: Known the world over for their snorkeling and diving opportunities, the nine Similan Islands are a well-preserved paradise. The beach is just the beginning. Take your precious time to discover all the hidden anchorages, the underwater scenery, and lush forest. You’ll find many ranger-protected areas for tortoises and their eggs while walking along the beaches, and snorkelers will be thrilled with the multitude of fish they’ll encounter. Day 8 – 9: Set sail back to Phuket, taking the same route you did when you left. Enjoy your final evening off the magical shores of Thailand. 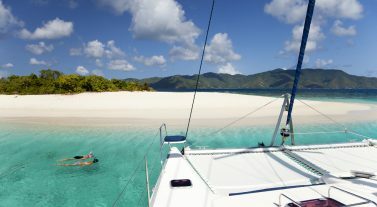 Day 10: Check out at the Dream Yacht Charter base. Day 2: Sail South from Phuket, passing some of the most gorgeous islands imaginable. Stop at Koh Racha Yaï and anchor for the evening. Enjoy the first splendid sunset of your Thai adventure. Day 3 – 4: Sail towards Koh Rok-Nok and settle in. Relax here for two days, swimming around in crystal-clear waters. This area makes for some impressive snorkeling. Explore the underwater world of the coral reef then lounge on the white sand beach. Day 5: Anchor at Koh Ha Yaï, where cliffs jet out into the sea over white sand beaches. Day 6 – 7: From Koh Ha Yaï, head towards Koh Phi Phi, which is considered one of the three most beautiful islands in the world. Day 8: From Koh Phi Phi, set sail for Ao Nang or Ralay, both situated on the coast of Krabi. Stop over in Koh Kaï, where you to walk from one island to another at low tide. Outstanding beaches await you, each one more beautiful than the last. 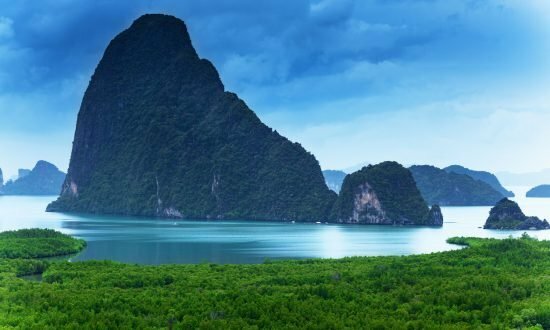 Day 9 – 10: Excellent anchorages are to be found at the prestigious Phang Nga Bay. Secret lagoons and crystal clear waters highlight the unspoiled beauty of this magical bay. This will be an unforgettable end to your Thai getaway. Day 11: Phuket – Check out at the Dream Yacht Thailand base. Day 3: Sail north along the West coast of Phuket, where you’ll find plenty of idyllic anchorages for the night. We also recommend a stopover at the well-protected bay of Thap Lamu. Day 4: Keep following the West coast of Thailand to enter into the mangroves, situated right by Phra Thong Island, where you’ll spend the night. Experience the satisfying solitude of this hideout. Day 5: Crossing straight westwards, you’ll come to the islands of Surin. Scuba divers should check out Richelieu Rock, one of the best spots in the world for diving with whale sharks. Day 6 – 7: The islands of Surin offer visitors a remarkable sense of calmness. There is also a village in the channel, inhabited by the nomadic seafaring Moken people. Day 8: Head further south towards the Similan Islands. Stop over at Koh Ta Chaï and Koh Bon to chance a manta ray sighting. Day 9 – 11: Arrive at the magnificent Similans, a genuine snorkeling paradise.These nine islands will captivate you immediately – huge boulders line the shores on several of the islands, and the pristine white sand beaches are often deserted. The most interesting sights, however, are to be found beneath the waves – some of the most spectacular coral in the world can be seen here. 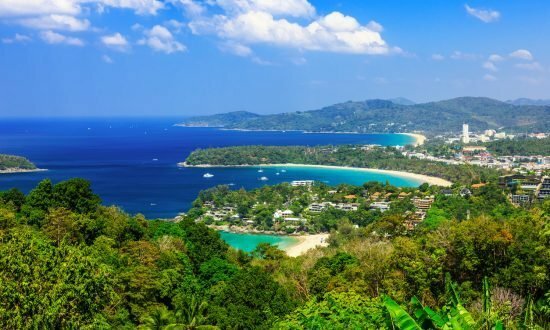 Day 12 – 13: Head back southwards to reach Phuket with a short stopover at the beach of Naï Harn. Day 14: Phuket – Check out at the Dream Yacht Thailand base. Day 1: Phuket – Welcome to the base of Dream Yacht Thailand situated at Yacht Haven in the North East of Phuket. Board for the night. Day 3 – 4: From Koh Racha Yaï, head towards Koh Phi Phi, which is considered one of the three most beautiful islands in the world. Day 5: Make the quick sail to Koh Lanta, where you can purchase fresh fruits, fish, and vegetables. Day 6: Anchor at Koh Muk, a fishing community, stopping at Koh N’Gai on your way. On Koh Muk, a mysterious closed cavern opens onto a beautiful lagoon. You have to see it to believe it! Day 7 – 8: Make your way back to Koh N’Gai, stopping to do everything you missed on your quick Day 6 peek. Day 9: Set sail for Koh Rok-Nok / Koh Ha Yai, a small group of islands. With cliffs jetting out into the sea, carve out your own spot on the white sand beach. Day 10: Sail back to Koh Ha Yaï or Koh Phi Phi to spend the night. Day 11: From Koh Phi Phi, set sail for Ao Nang or Ralay, both situated on the coast of Krabi. Stop over in Koh Kaï, where you to walk from one island to another at low tide. Outstanding beaches await you, each one more beautiful than the last. Day 12 – 14: Excellent anchorages are to be found at the prestigious Phang Nga Bay. Secret lagoons and crystal clear waters highlight the unspoiled beauty of this magical bay. This will be an unforgettable end to your Thai getaway. Day 15: Phuket – Check out at the Dream Yacht Thailand base. International flights from main cities in Europe are available daily with a stopover Between the airport and the base it is a 20 minutes ride by taxi. Dream Yacht can organize transfer, feel free to contact us for more details and price. Our office is located in the condominium part overhanging marina and access channel. You will be at immediate proximity with the swimming pool, fitness center and toilet facility (WC and showers), Free of charge in our office or in the marina WIFI service. Several Thai restaurant located near the office or the marina will pleased food amateurs as also the pub/restaurant of the marina. 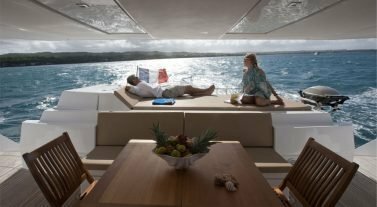 If you want, Dream Yacht can managed the provisioning for you: at your arrival all the provisioning will be waiting on board your yacht. You just have to fill and return the provisioning order list (for the food, beverages and alcohol) available on the website. A small grocery shop is located near the base (only basic product and no alcohol), the main supermarket are locate 30km from the base. Visa and Mastercard can be used in most places (don’t forget to inform your bank of your travel to have your card unlock if necessary). You should take some cash with you as the cash point are not easily available during your cruise, you will find a DAB just near our office. The local currency is the Baht, the US dollar and Euro is also accepted and easy to change. Roaming is available in Thailand, just check before your departure with your local mobile phone provider the activation of the international option and the price of the communication. You can also buy a local SIM card at our office. Space is quite limited on board, so plan to use soft luggage. By respect please never touch a Thai’s head, never point at a Thai with your foot when seated. 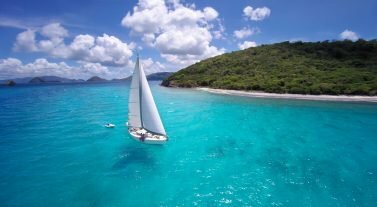 Our Crewed Yacht Charters are the pinnacle of all inclusive luxury: your private floating five-star villa, gourmet chef, and crew at your service.